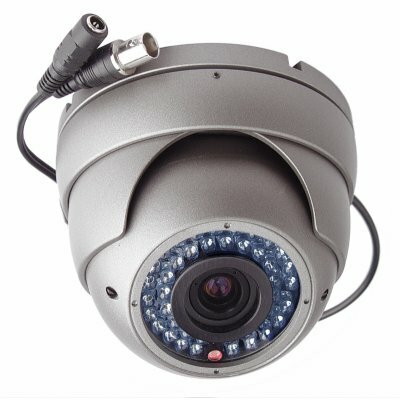 Successfully Added Vandal Proof Day + Night Dome Camera - 1/3 Inch CCD (NTSC) to your Shopping Cart. Fight back with this vandal proof day and night dome camera with 1/3 inch Sharp CCD sensor and 42 IR LED's for night time illumination. It is made of a sturdy metallic casing and is built to withstand everyday use as well as unusually harsh abuse. This is a high profile, mid-sized security camera meant to be seen by visitors, shoppers, employees, and potential criminals. With its proven pivoted dome design, it cannot be torn down like old style arm mounted cameras. It will stay in place and record everything that is happening so you can see and record the activity the whole time! This model Vandalproof Dome Camera has incredible night vision with 42 infrared LED's and is also weatherproof for indoor or covered outdoor installations. Order 1 or 100 at Chinavasion's low wholesale prices. Importing this item is incredibly simple, and they are kept in large stock in our warehouse, so add to your online inventory for dropship sales or click "add to cart" right now and we will ship it out to you tomorrow! This surveillance camera uses the NTSC color system. It will work with any modern viewing and recording device that is PAL/NTSC compatible. If you need a PAL only version then please order CVAJM-950-PAL. This is a CCTV video camera. It is not wireless/cordless, you will need to connect cables from the camera to a computer, monitor or TV screen.